No matter what type of system you have, it will have one or more powerful springs that help it open and close. 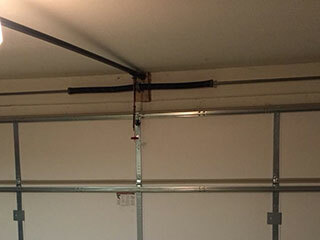 A garage door can weigh as much as four hundred pounds, and these components have to support and counterbalance this weight every time the system opens and closes. Without them, you wouldn't be able to use the door. Unfortunately, dealing with these components can be very dangerous. That's why, if anything goes wrong you'll need a professional to quickly come and take care of things for you. It’s not a case of if these components will break; it’s a case of when. A strong, well-maintained torsion spring can last for ten years, or even more, if it receives adequate maintenance. However, it will eventually weaken and require replacement. Generally speaking, the better the spring, the longer it lasts; the cheap variations can fail in as little as 3 years, while high quality units from top brands can last double or even triple that time. When a spring does break, it makes your door difficult or impossible to use. It can also be dangerous for anyone in the area, as the sudden release of tension can cause the steel coils to go whipping around. That's why it’s a good idea to watch out for signs that these components are wearing out and treat them accordingly. If your door is squealing or wobbling when it moves, or if starts to open unevenly or slower than usual, this could be a sign that the springs are losing tension and are beginning to weaken. Torsion springs, which we've mentioned before, operate by using torque in order to help the panels move. They are installed above the door, horizontally, and are usually strong enough that only a single unit is required. Extension springs are not as powerful, and are installed in pairs, one on each side of the door, in a position perpendicular to the panels. They work by stretching when the panels lower and then contracting in order to bring them back up when the door needs to open. Whichever type your have installed, you can count on our technicians to be able to handle them expertly. Our team at Garage Door Repair Brushy Creek is ready to help with any spring replacement or adjustment you may require. Don't hesitate to contact us as soon as you notice something is wrong. These components are dangerous, and you must never take any risks when dealing with a problem related to them.